That merger between Deutsche Bank and Commerzbank, which is contingent on the biggest German lender's inability to turn operations around, is looking increasingly likely, because earlier today Deutsche Bank reported earnings which confirmed that, well, it is simply unable to make said much-needed turn. 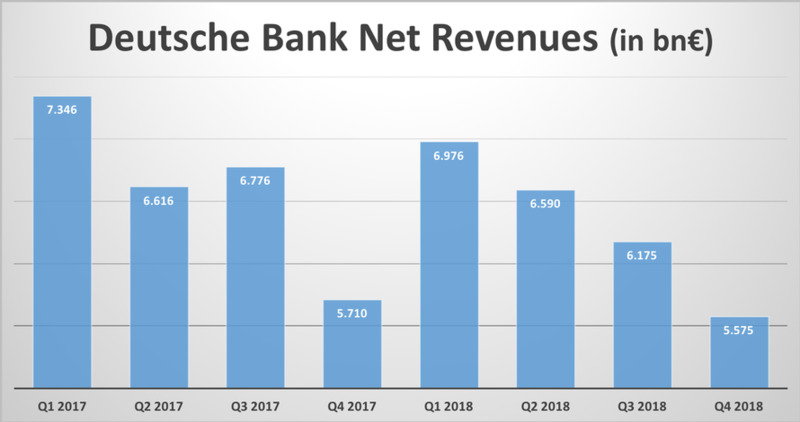 Deutsche Bank reported Q4 net revenue of €5.58BN - the lowest quarterly print in years - and 2.6% below the average analyst estimate of €5.73, led by another decline in trading revenue, resulting in a pretax loss of €319 million in line with estimates of a €331.0 million loss. And as the bank shrank for an eighth straight quarter in the final months of last year, CEO Christian Sewing pledged, even more, cost cuts although it is clear by now that cost-cutting has starting to eat into profits. To wit, in the volatile fourth quarter, in which market gyrations were supposed to help the company's trading desk (despite images of police raiding the bank’s headquarters in November) revenue shrank another 2.4%, led by a slump in the key fixed-income trading business that did even worse than peers. The key bank's securities unit slumped, losing market share particularly in fixed income trading, where revenue slumped 23%, but also in equities, which declined 0.8%; both missed consensus estimates. The bank's U.S. peers on average reported a 17% drop in FICC and 4% higher equities revenue.